The best chapter of Pearson’s breakup is yet to be written. Selling a 47 percent stake in book publisher Penguin Random House to co-owner Bertelsmann might generate twice as much as the Financial Times, which the UK group parcelled off to Japan’s Nikkei for 844 million pounds (1.2 billion euros) last month. Chief Executive John Fallon can unshackle himself from the publisher of “Fifty Shades of Grey” as early as October, when a lockup ends. Yet it makes sense to wait. Pearson and Bertelsmann pooled their English-language book businesses in an all-share deal in mid-2013. The Germans have a 53 percent stake and managerial control. For Pearson, now focusing entirely on education, the stake is a financial investment, recorded in its accounts at a value of 1.1 billion pounds (1.6 billion euros). Comparable valuations suggest it is worth more. Rival Bloomsbury Publishing trades at 7.6 times last year’s EBITDA, Thomson Reuters data shows. Penguin Random House has better pricing power and a wider stable of authors, raising its chances of generating bestsellers. Applying a multiple of 10 to the venture’s 2014 EBITDA of around 420 million euros, Pearson’s stake in the virtually debt-free division could be worth 2 billion euros. One reason to wait is that the joint venture isn’t yet fully grown. The publisher should be able to squeeze costs by, say, 4 percent of revenue as a result of the original 2013 merger, and those benefits aren’t yet reflected in its accounts. Take that roughly 130 million euros of savings, tax and capitalise it, and Pearson’s share of the synergies could be worth up to 500 million euros. That’s not including the revenue benefits from negotiating from a better position with retailers like Amazon. This lifts the price tag of Pearson’s stake to about 2.5 billion euros ($2.7 billion). Family owned Bertelsmann could easily afford this – its net debt of 1.7 billion euros is less than one year’s worth of the group’s EBITDA. But there’s no need to move now. Selling the FT gives Pearson cash to play with while the book joint venture gets up to speed, and maybe expands through acquisitions, as in last year’s purchase of Spanish publisher Santillana Ediciones Generales. Compelling stories shouldn’t be rushed. 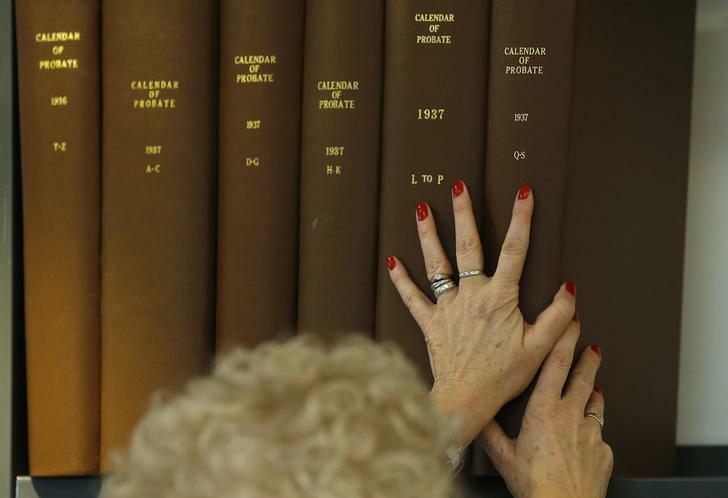 A librarian places probate records onto a shelf at the newly restored Central Library in Liverpool, northern England January 23, 2013. Pearson will be free to sell its 47 percent stake in book publisher Penguin Random House to co-owner Bertelsmann when a lockup agreement ends in October. Pearson and its German partner merged their English-language book publishers Penguin and Random House in 2013. Bertelsmann holds 53 percent of the company and runs the day-to-day operations. Penguin Random House made revenue of 3.3 billion euros and EBITDA of 452 million euros in 2014. That includes the German-language book publishing business of Bertelsmann, which contributed a bit less than 30 million euros, according to people familiar with the situation. On July 23, Pearson announced it had agreed to sell the FT Group to Japan’s Nikkei for 844 million pounds in cash, saying it will focus on its global education business. It is also in talks about divesting its 50 percent stake in weekly magazine The Economist.